When your reputation is on the line, you need a truck with the power to keep you and your business on top. That’s why the Ford Super Duty series doesn’t back down when things get serious. Get the job done with the Ford F-350 SRW or take on the F-350 DRW for the heaviest work. It’s powered by a legend. The Super Duty’s available 6.7L Power Stroke Turbo Diesel V8 engine delivers the best-in-class standard torque of 935 lb-ft, best-in-class horsepower of 450, and class-leading diesel fuel efficiency. Inline 6 diesels better make way, because there’s no stopping this freight train! Those who prefer to count octane rather than cetane at the pumps will appreciate the E85-capable 6.2L gasoline V8 engine. With best-in-class horsepower, it’s not like you’re opting for second-best. This pickup will crown you as the king of the worksite. If you’re looking for the best selection of hauling trucks, then stop into Metro Ford, the largest Ford dealership in Port Coquitlam. We’re just a short drive from Maple Ridge, Pitt Meadows, Port Moody, and Burnaby, British Columbia. Just because your job is hard doesn’t mean that you can’t get comfortable behind the wheel. The Super Duty’s interior features contoured front seats, standard manual lumbar support, and power lumbar support. Just like every part of the Super Duty, the interior is designed with function in mind. It offers 1st and 2nd-row under-seat locking storage, a rear view camera, reverse sensing system, and all-weather floor mats. If tough-as-nails had a look, it would be the Super Duty. The Super Duty’s frame, concealed behind thick dent-resistant body panels, is designed to handle massive twisting forces, thanks to a fully boxed frame with 6.7-mm-thick C-channel rails and crossmembers. Just like a steel building, the structure of the Super Duty depends on the strength and durability of its foundation. With a yield strength of 36,000 psi, its frame won’t give in even under the most extreme stresses of the job. 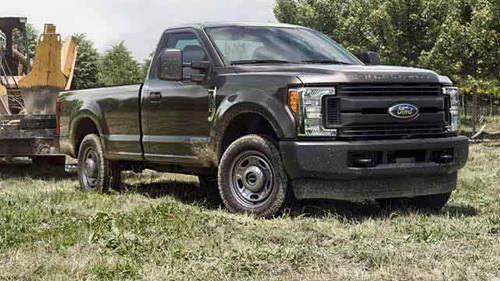 With a maximum towing capacity of 35,000 lb (15,875 kg), the Super Duty can pull more than any other truck in its class. Backing this locomotive-like load capacity is the available Ford-built Power Stroke V8 Turbo Diesel engine. Ford squeezes even more power out of the Super Duty’s engine by using a larger turbocharger and upgraded fuel pump to keep up its best-in-class horsepower, torque, and fuel efficiency. The standard 6.2L gasoline engine uses large, heavy-duty pistons, intake, and exhaust valves with a large engine bore to deliver more best-in-class gasoline horsepower and effortless torque. Ford also offers compressed natural gas (CNG) and propane autogas conversions for this E85-capable engine. It’s like driving a fortress which just so happens to be smooth and maneuverable. The 2018 Super Duty’s powerful construction ensures it’ll stand strong in the event of a collision, but that doesn’t mean it’s not soft on the inside. Six airbags are standard on all Super Duty models, including front airbags, front side-impact airbags and the Safety Canopy system with roll-fold technology, along with the AdvanceTrac system to help you stay under control when turning tight corners or swerving to avoid something in the road. Your Super Duty is prepped and ready for work the moment it leaves the lot. Keep it that way with certified F-350 truck parts from Metro Ford. We have accessories to make hauling easier and more convenient, like towing mirrors, trailer kits, and more. Whether you do your maintenance yourself or want to leave your truck in the hands of our factory-trained Ford technicians, we’ll help you keep your Super Duty on the road and ready to work. Order your parts online, or book a service appointment today.